Lenny & Prasen on Dolphin’s Nose with Perumal peak in the far left. A panoramic composite image from January 2016. The grasslands mapping project that took shape at the plantations conference in Kodaikanal in December 2014 produced a report that was published earlier this year. This is important work and represents the combined efforts of several disparate individuals, organizations and funding agencies. The preliminary visual assessment of Landsat imagery by the author showed that satellite data held spatial evidence of dramatic land cover change in the Western Ghats and Palani Hills but that it needed to be quantified. Robin Vijayan of ISER Tirupati put into motion a study in 2016 with key field work and spatial analysis being done by M. Arasumani and Danesh Khan. Further academic guidance was provided by Arundhati Das, Milind Bunyan and several others. Bob Stewart & Tanya Balcar, of the Vattakanal Conservation Trust, provided key insights on shola regeneration in plantations-the topic that originally brought everyone together. INTACH and ISER Tirupati helped provide funding of the field work. The Tamil Nadu Forest Department was an important stakeholder and helped provide permissions for the field work. Prasen Yadav joined the project to document the work and produce a video of the findings. The study was peer reviewed and published in January 2018. It is publicly available on PLOS One, including access to all the tables of data and charts (see link below). My involvement with the grasslands mapping brings together several interests and is the latest chapter in my ongoing interest and love affair with the Palani Hills. An alarming conclusion of the study is the great extent to which the montane grasslands have been taken over by non-native trees and weeds. Those of us who have been walking in the hills have had a sense of this but the satellite images providing damning proof. It is also clear that the plantations have spread far beyond the original boundaries that they were originally designed to be in. Most of the southern escarpment has a fire line etched into its grasslands and now plantations species are spreading beyond this boundary and down the steep slopes of montane grasslands. This leads to clear conclusion that where possible efforts need to be made to preserve these last remaining vestiges of montane grasslands. The challenge is that, in spite of the surprising resilience of shola tree species, the last montane grasslands are being steadily consumed by plantation (and some shola) species. Identify and conserve core grasslands: Core grassland areas consist of a few to many hectares of grassland encompassing hillocks, streams, marshes and rock outcrops. These areas, even when nestled in a plantation matrix, should be protected and form the core around which grassland restoration efforts should focus. Check invasion in sparsely invaded grasslands: These areas are often characterized by young plantations located in grasslands where grass cover is still extensive. Here, we recommend physical removal of invasive species. Forest departments often have access to significant funding through the Compensatory Afforestation (Bill passed in 2016) funds and these could be utilized for these activities. Such funds could be used for the restoration of marshes, existing grasslands and to manage the invasive plantations. Review indiscriminate removal of mature plantations: Mature plantations often have native shola forest regenerating under them and lack native grass cover. Grassland restoration here is likely to be very resource-intensive. Conservation efforts should focus on sparsely invaded and pristine grasslands. In mature plantations, we recommend conducting experimental or controlled studies (like at Vattavada, Munnar Kerala), perhaps also examining the role of fire, and monitoring soil and moisture conditions in these areas. Moreover, removal of mature plantations could stimulate regeneration of plantation species from saturated soil seed banks. Monitoring of these areas is important to assess the effectiveness of plantation removal. Contain agriculture: Our field surveys indicate that paddy cultivation has been discontinued in some marshes. Given the critical role of these marshes in regulating local hydrology, efforts should be made to contain agriculture to the current extent and restore these marshes using a community-led conservation effort. Figure 3L PLOS One article graph showing dramatic shifts in land cover. Several other writes have reviewed the PLOS article in the popular press and I have listed articles in the Wire by Janaki Lenin, Mohan Rao in the Hindu and Pendharkar, Vrushal in Mongabay. This year is a special year since it marks the cycle of Kurinji (Strobilanthes kunthianus) blooming that only happens every 12 years. Kurinji plants, more than any other grasslands species, are closely associated with healthy montane grassland systems. The extent of this year’s flowering will be a good gauge of the health of the grasslands of the Palani Hills. 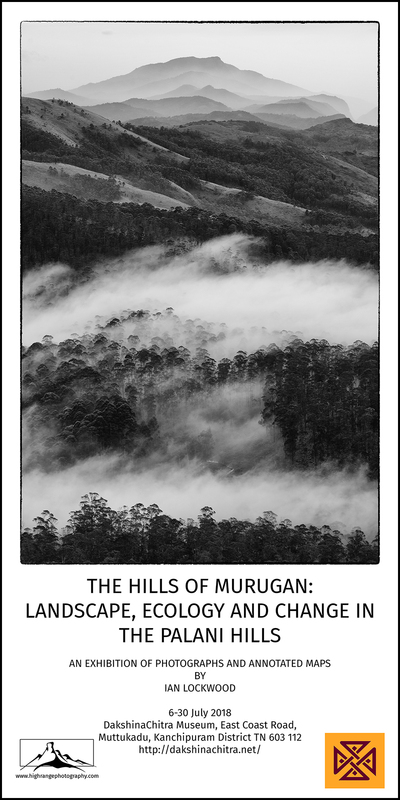 My next personal chapter in this process to better understand the landscape and ecology of the Palani Hills is to present and share an exhibition of photographs and annotated maps at DakshinaChitra, Chennai this July. The next post will highlight this significant endeavor. Southern escarpment on a very clear day looking west to the Agamalai range and beyond. January 2016. Lenin, Janaki “You’d Think Cutting Kodai Plantations Will Save Its Grasslands. It Won’t.” The Wire. 19 September 2017. Web. Lockwood, Ian. “Mapping Montane Grasslands in the Palani Hills.” Ian Lockwood Blog. August 2016. Web. 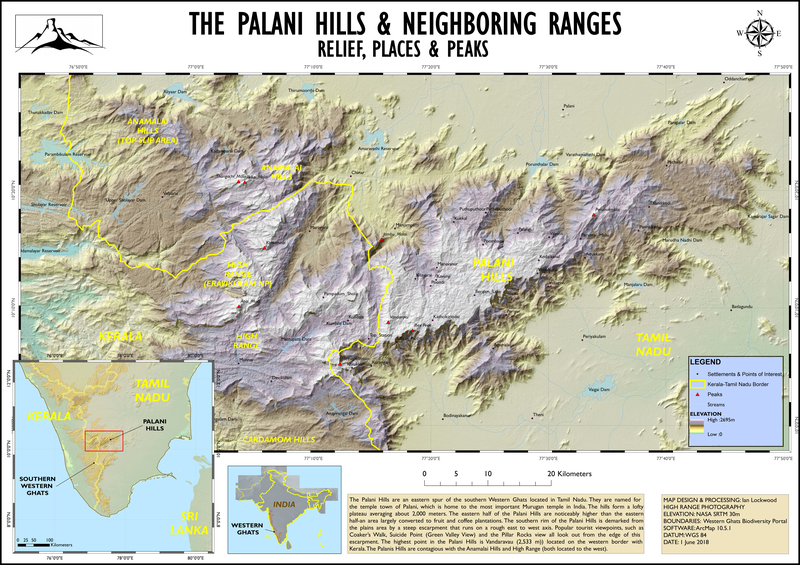 “ “Land Cover Changes in the Palani Hills: A Preliminary Visual Assessment.” Ian Lockwood Blog. 4 April 2014. Web. Pendharkar, Vrushal. “Palani Hills: Where have the grasslands gone?” Mongabay. 20 February 2018. Web. Rao, Mohan. “Missing the grass for the trees in Western Ghats.” The Hindu. 17 January 2018. Web. Yadav, Prasenjeet. “Save our Shola Grasslands.” YouTube. Web-Video. 16 September 2017. 3D model of the OSC created on DroneDeploy based on data from the April 6th flight (approximately 81 images). For the last year or so it has been my goal to use drones to better study areas and analyze patterns of land use and vegetation cover. I was first inspired by the work that IWMI was doing to map crops, irrigation and drainage basins using their fixed wing drone (see articles below for references). During the last two years there has been a good deal of excitement of using drones/UAVs for geospatial applications and I am entering the field relatively late. One of the notable highlights of Sri Lanka’s first GIS Users conference held in February 2018 was a presentation on the use of consumer-level drones to map small areas. A Sri Lanka Ministry of Defense Research & Development team demonstrated in real time how easy it was to program a flight path, put a drone up, collect data and then process it so that it could be used for analysis using GIS. Based on their example and the advice of IWMI’s GIS team, I have been working to use the school’s Phantom III Advanced drone to map our campus as well as the nearby Diyasaru wetlands. This post share some of the results as well as my workflow. Poster of April 6th drone map of the OSC campus, created on ArcMap 10.5.1. Results from the May 19th drone flights using PIX4D. This is a composite of two different flights, each with about 30-50 separate images that have been mosaiced and geo-referenced here. If you look closely you will see the OSC Class of 2019 DP Geography class on the west side of the field. Also note the missing large mahogany tree north of the pool that was regrettably cut down by the neighbors between the two flights. Step 1 Having a drone is essential and many of the common consumer models can be programed to fly a set flight plan. We used a DJI Phantom III Advanced model that is the older of our two drones (it has already had several major accidents and gone underwater at least twice). The drone needs to be working properly and the micro SD card should be formatted before running the mapping flight. We have been doing a very short test pre-flight on the DJI app that we control the drone with. Step 2 You need an app to establish the flight path and program the drone to fly and take pictures at established intervals. We started with a trial version of DroneDeploy and have now loaded in a trial version of PIX4D. Unfortunately, the licensed copies of both of these software bundles are prohibitively expensive for small non-commercial programs like ours and I will have to work out a long-term solution so that students can continue the mapping that we have started. The proposed mapping area needs to be loaded into the drone using the app. For DroneDeploy I made the flight plans on a desktop computer (in the DroneDeploy website) and then imported them onto the phone app that is hooked up to the controller. There are several parameters to pre-set such as the overlap flap area, flight altitude etc. The higher the altitude, the more accurate and less distorted the stitched imagery but it is coarser (less detailed). For PIX4D I have been setting the flight area on my phone in the field. Step 3 At your location you can launch the drone from a cleared area. We use the school field where there is plenty of room and a clear line of sight between the controller and drone (though it is flying by GPS, apparently). When you have got the drone and controller (with a phone interface) unit set up, you are ready for the flight. On DroneDeploy you import the plan, it goes through a number of checks and then asks if you are ready to fly. With the click of a button, the drone hovers and then takes off to run its flight. You can see the images that it takes and the drone’s flight path. Our flights have been set to 75 meters height and they are supposed to be taking approximately 60-90 images for 2 hectares. Unfortunately, we have been having a lot of trouble with good flights but no images being recorded at the end. For this reason, we started using the Trial version of PIX4D and had more success. Step 4 After a relatively short flight (5-12 minutes for us) the drone returns and lands and it is time to check to see if the images were collected. If it has gone well, then DroneDeploy will show you a sample mosaiced thumbnail. You need to shut down the unit and then move back to the desktop computer to upload the imagery on to their website where it is mosaiced. It took two hours for them to make the mosaic on the cloud and if you have a license you will also get a 3D model and vegetation map. For PIX4D there is a process where the images are fed from the mini-SD card to the phone and then uploaded online. You can also take the card and load them on to the PIX4D desktop app. All of these steps depend on you having the software and again I am not sure what we are going to do after the trial versions are finished. Step 5. In the final step you should have several files to work with. DroneDeploy gives you the orthomosaic and a 3D digital surface model (DSF) as well as a 3D model that you view on the screen. They also provide a KML/KMZ which you can bring into Google Earth (see sample below). PIX4D provides a collection of files (including point clouds, DSFs and more) that can be downloaded. I was most interested in the orthomosaic since I can then pull that into ArcMap where I can use it for presentation and analysis (see above). Mosaic of April flight overlaid in Google Earth as a KML file. PIX4D plan as seen on the flight controller. OSC pool just before a pre-monsoon deluge. Field and M block before the pre-monsoon deluge. Drone mapping offers a new and dynamic way to visualize landscapes on a relatively large scale. Prices of drones have come down and the challenge is to acquire software that allows you to get your work done. Trial versions of PIX4D and DroneDeploy give you a chance to explore the possibilities and map out a few areas of interest. There are open source options that I need to explore once my trial licenses have run out. Anyone who knows my interests will realize that I am now itching to get drones into forest and mountain landscapes where they can be used to better map vegetation and land cover. Daniel, Smriti. “The Drone Buzz Over Sri Lanka.” Sci Dev Net. 19 September 2015. Web. Lockwood, Ian. GIS Developments at OSC in 2014.” Ian Lockwood Blog. 26 November 2014. Web. (this post features views of the OSC campus via GoogleEarth and ArcGIS). Mason, Tony. “Put Your Drone to Work. Arc News. Summer 2016. Web. Siddiqui, Salman. “Sri Lanka’s Drone Pioneers.” ICT Update. 18 April 2016. Web. Geospatial Teaching & Learning website home page featuring a Landsat image of one of my favorites areas-the Sundarban. Processed by the author using raw NASA tiles in an ARCGIS environment. Click on the image to access the website and PDFs of presentation folders. In February, the American School of Bombay held its regional technology conference and workshop ASB Unplugged. The three days of presentations, interactive sessions and discussions gave me a chance to observe and check in on a school well known for into innovative use of technology in the classroom. I participated in the event and was also presented my workshop entitled: Geospatial Teaching & Learning: Opportunities, Applications and Ideas for International Educators. The workshop offered an opportunity to review recent developments in the fields of Geographic Information Systems (GIS) & Remote Sensing (RS) with a special emphasis on potential applications for international school teachers. Geospatial fields continue to experience rapid changes as technology develops, data become cheaper and more assessable and software is easier to use. That is good news for educators interesting in incorporating geospatial applications in their classrooms. Story Telling With Maps: One of the most useful aspects of the workshop focuses on how interactive stories based on maps and imagery are a great way to highlight the cases studies that are central to the teaching of DP Geography. These can be viewed but can also be created by students and teachers as a means of developing knowledge about case studies that are not well publicized. ESRI’s Storymaps and Google’s Tour Builder are two excellent web based options. OpenStreetMap offers opportunities for students and teachers to get involved in mapping their own neighborhoods in a wiki-based global mapping project. Users can then access this spatial data and a vast treasure trove of vector data that has been contributed by users all over the world, as a part of a local-based research project. Field Data Gathering With Mobile Apps: The development of mobile data gathering platforms has been a significant boon for geography and science teachers looking to collect survey data and then to enhance it with locational information. The December post highlighted how we are using Survey 123 here at OSC. Mapping With Drones: Most international schools have drones as part of their maker spaces or technology departments. OSC has two that are beginning to be used, mainly for providing cool aerial perspectives of the campus and special events. I am working on using our drone to map the campus and other key study areas (wetlands, forest areas etc.). At the recently concluded GIS Users Conference I was impressed with a real-time demonstration by a Ministry of Defense R&D team to map a small area. I am working with the OSC tech team to get Drone Deploy (to pre-establish the flight path and order of images taken) and Drone2Map to create the orthomosaic or 3D model of the area. 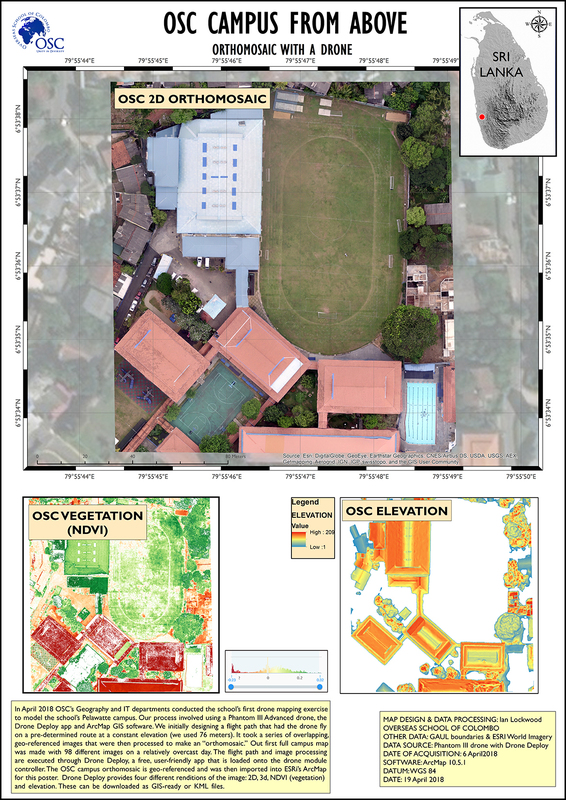 GIS Developments at OSC in 2015 January 2015. GIS as a tool for teaching and learning in the DP Geography program (the field, Survey Department and in a final Geography EE map). November 15th marked GIS Day, a time set aside to recognize the important role of Geographical Information Systems (GIS) in our lives. With a theme of GIS as the “science of where” it seems like a good time to look at ways in which we are using GIS as a tool for teaching and learning at OSC. Ten years ago, I put in the first proposals to adopt a GIS program at OSC as a part of our MYP and DP Geography courses. Since then the school’s small program has grown steadily while there have also been enormous leaps in the technology. This post reviews the newer applications and data sources that I am using as a tool for geospatial teaching and learning in the OSC environment. As far as I know, there are no explicit requirements that GIS skills be taught in any IB course. There are references made to GIS in the revised DP Geography, First Examinations May 2019 syllabus though they are not required (unfortunately, from my perspective). On page 19 it says “it is recognized that the ability to use GIS as a tool is a valuable geographic skill that goes beyond many of those listed below. Where GIS is accessible and practical, its use is encouraged.” Of course, there are many geographic skills listed in the guide that can be taught using a GIS platform. The Environmental Systems & Societies, First Examinations 2017 syllabus in the Investigating Ecosystems (2.5) section mentions GIS as a tool to use when tracking land use change (see p. 38). At OSC I take time to teach several basic GIS lessons in DP Geography that allows students to use it as a tool for case studies and work on the internal assessment. In the past, I have worked with MYP students to introduce them to skills and methods for using our ArcGIS software. This year we are once again introducing GIS skills for MY 5 so that they can map spatial patterns from their Galle socio-economic survey work. A typical home garden on the boundary of Sinharaja. Like most plots tea is the key crop. Conducting a survey in a Kudawa tea shop. Conducting a survey in a home garden. Collecting data on a phone and on paper (as a backup). The advent of wide spread use of smartphones and improved 4G cellphone networks has opened up opportunities to use mobile data gathering apps on phones. There are a variety of options including open source apps (Open Data Kit, etc.). I am using ESRI’s Survey123 which comes with our ArcGIS site license. For the first time this year we recorded all of the DP Geography Sinharaja field surveys on Survey123. The class set up a common survey with questions about gender, housing, water access, land use and other variables. Before we went to the field we trialed a simpler version in Colombo. In the field, every student had a phone but we also backed it up with paper copies. At times, there was no cell phone access. We were able to upload the data later when we had cell phone connectivity (this worked quite well although photographs attached to the survey slowed down the uploads considerably). It was a much better way to tabulate the data (there were more than 70 individual respondents in total) and the class could map the data points since each had a spatial reference. At the same time, I have been experimenting with using phone apps to track and record hikes and trails that we walk on CAS experiences. Strava, a fitness oriented app, offers an excellent way to record tracks. I am exporting GPX trails and then putting them onto Google my maps and sharing them with participants. I’ve taught students how to use them as a way to record key paths on their CAS blogs (see Maha’s Off the Grid post or my Mannar account for an example of this). We are currently using Google My Maps for this and layering the GPX trails onto a map that we make public. I would like to use an Openstreetmap for the base layer but this requires a WordPress plugin and $$$. In terms of hardware we are operating a basic system with a server/desktop and then four lab desktops (each with decent specs-16 GB RAM, fast processors, graphics cards, large (2tb) drives and wide HD monitors. Geography students have access to ArcGIS Online on their laptops (both OSC and Windows platforms). When it comes to working with imagery I find it easier to use the desktops where I have spatial data stored for specific class assignments. There are a variety of software options for using GIS as an educational tool. The most widely used open source GIS software package must surely be QGIS. It has an OSX version and the interface is quite similar to ArcGIS. At the school we continue to use the industry-standard, proprietary ArcGIS group of applications and have maintained an advanced license for over the last eight years through GIS Solutions here in Colombo. I am able to get technical advice from IWMI’s GIS lab when there are new operations or application that we want to put to test. I have also developed relationships with other major GIS users who are working on environmental issues in Sri Lanka. In the last two years we have been using Openstreet Maps and have made minor contributions in our neighborhood and areas of interest. I value the idea of an open platform wiki space where users can contribute spatial knowledge. It is also an excellent source for downloading shapefiles of houses, building, roads, and other features in our Sri Lankan study areas. This data is often more update to shapefiles that are commercially available. We have had students download OSM data and then use the shape files to design studies of land use in the Colombo CBD (see attached image). OSC’s GIS initiatives continue to enjoy support for several key Colombo-based players. The International Water Management Institute’s (IWMI) GIS lab has been our main resource. They provide us with technical guidance and share public data that can be used for student learning. Their Water Data Portal is an important source of publically available spatial data. Dr. Ajith Gunawadena at the Central Environment Authority’s Research and Development (GIS) unit has become a good friend. He has helped me understand the ways in which the CEA and other government agencies are using GIS to tackle a range of national challenges. He helped guide the production of district level spatial databases (resource profiles). I have developed good relations at the Sri Lankan Forest Department. Their GIS unit is working on updating the forestry map of Sri Lanka (last completed in 2010) and I have had a chance to see how they are using remoted sensed imagery to inventory different types of forest cover. The best way to access their basic forest data is on the FAO-sponsored REDD+ National Forest Monitory System portal. At the invitation of Anura Sathurasinghe, several of our DP2 students and I participated in the recently held 27th Asia Pacific Forestry Commission meetings here in Colombo. Colombo is now growing rapidly and this has given students an opportunity to study process of urbanization and urban environments first hand. The port city project, still controversial but speeding ahead, is moving at a rapid pace. While the Urban Development Authority used to be the key agency for getting urban data, the Western Region Megapolis Planning Project now seems to be the main agency with data and information about Colombo’s urban projects. Master plans are available on their website for download. The Sri Lankan Survey Department continues to be a remarkable government agency that supports geographic teaching and learning in the country. I have always appreciated their open view to public access to maps and spatial data. At the GIS Day 2017 event several of their team members spoke about developments at the SLSD. Sarath Jayatilaka and N. Wijeyanayake, traced the historical development of mapping at the department. Mr. Sivanantharajah bought the audience up to date with new developments in remote sensing including the use of lidar to generate highly accurate elevation models. The Survey Department is at work on a National Spatial Data Infrastructure (NSDI) platform but this is expected to be another six months or a year before it is unveiled to the public. Meanwhile some of their maps and data can be viewed on an interactive portal and their land information system. What would be nice is if Sri Lanka’s larger neighbors would be willing to learn from the island nation’s open approach to making spatial data and maps available to the public to improve overall geographic knowledge and understanding! Cover of CEA’s district spatial database (on CD). REDD+ National Monitoring System for Sri Lanka. When addressing core concepts of the Geography and ES&S syllabi there are now an amazing variety of map-based data portals to access up-to-date statistical data. I have been using the Washington DC-based Population Reference Bureau data tables to study and analyze population patterns for nearly 20 years in my teaching and they now are accompanied by interactive map portal. World Bank data, a leading source of data on economic development and poverty, can be found on their data portal. DP1 students made an important discovery when they accessed the Interactive Bangladesh Map. We were able to download the GIS-ready data and then view and manipulate it in an ArcGIS environment. I understand that they will be doing similar sites for country and global data. For data on the Himalayan region ICMOD maintains the Mountain Geoportal. The Sri Lanka Census & Statistics department has always been a good source of data. They now have an interactive geoportal to access some of this data. It is layered on an Openstreet base map. Bolstad, Paul. GIS Fundamentals: A First Text on Geographic Information Systems, Fifth Edition. Acton, MA,Xanedu, 2016. Print. Web Resource Link, (GIS lessons). Brown, Clint and Christian Harder Eds. The ArcGIS Imagery Book: New View. New Vision. Redlands, CA: ESRI Press. 2016. Print (Web version). ESRI. Advancing STEM Education with GIS. Redlands, CA. 2012. Web. ESRI. K-12 Education portal. Web. Harder, Christian and Clint Brown, Eds. The ArcGIS Book, 2nd Edition. Redlands, CA: ESRI Press. 2017. Web. PDF. Jensen, John R. Introductory Digital Image Processing: A Remote Sensing Perspective, 4th Edition. Glenview, IL: Pearson GIS, 2016. Print. Keranen, Kathyrn & Lyn Malone. Instructional Guide for the ArcGIS Book. Redlands, CA: ESRI Press, 2016. Print (Web version). Kimerling, A. Jon. et al. Map Use, Eighth Edition. Redlands, ESRI Press, 2016. Print. Web Link. Review by Daniel G. Cole. O’ Connor, Peter. GIS for A-level geography. Geographical Association/ESRI, 2008. Print. For the last three years Nature in Focus has been an important gathering for people interested in photography and conservation. While hosted in the south Indian metro of Bangalore it has a global outlook and many of the speakers and participants are experienced with photographic and conservation projects in the broader global context. The two day workshops held in early July are the brainchild of Kalyan Varma, one of India’s leading photographers/ cinematographers working in conservation. This year I have been privileged to be invited to share some of my experiences using photography as a tool for conservation. Accompanied by our daughter Amy I will be sharing images and insights from my experiences documenting landscapes and ecology in the Western Ghats/ Sri Lanka biodiversity hotspot. The talk will consider the black & white aesthetic in the South Asian context as well as the changes with process as the traditional darkroom has evolved with the advent of digital tools. I also wanted to share some of my personal personal experiments with using geospatial and multispectral opportunities to better understand changing landscapes in the hotspot. I’m looking forward to the opportunity to meet old friends, make new acquaintances and participate in the exchange of ideas for the benefit of biodiversity conservation. 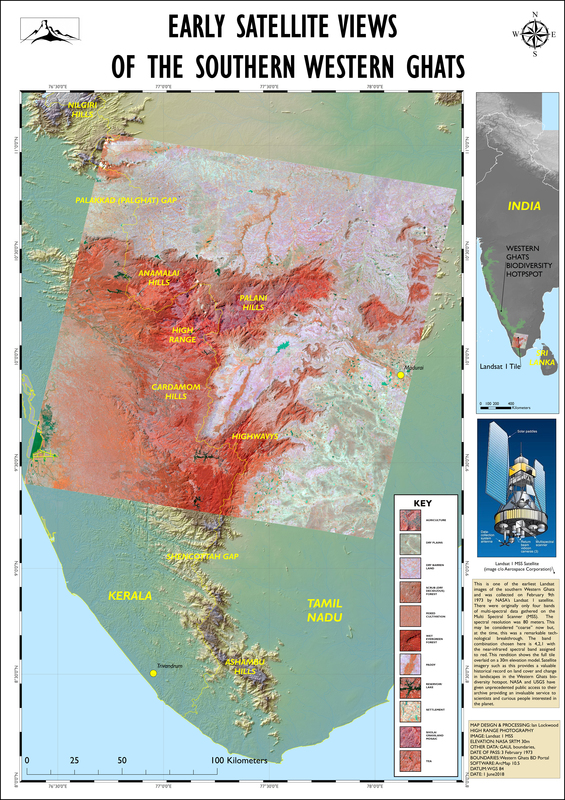 New work with GIS: Map showing selected portions of the southern Western Ghats emphasizing Landsat thermal bands above 380 meters. Anai Mudi Moonscape, Eravikulam National Park (March 1993). Fujica 6×9 (80 mm) fixed lens. Konica Infrared 120 film. Farmer burning agricultural waste, Kukkal, Palani Hills (May 2002). Mamiya 6 with 80 mm lens, Kodak T-Max 100 120 film. New growth, Anamalais Tiger Reserve, (June 1998). Mamiya 6 with 80 mm lens, Kodak T-Max 100 120 film. Sabaraimalai Piligrims, Periyar Tiger Reserve (January 2002). Mamiya 6 with 80 mm lens, Kodak T-Max 100 120 film. First light on Twin Peaks with the South West Monsoon over Kerala, Palani Hills (June 2012). Digital composite image using a Nikon D-300 with 24-70mm lens.